The story of the Moonrise quilt really begins exactly a year ago when I attended Spring Quilt Market in St. Louis. 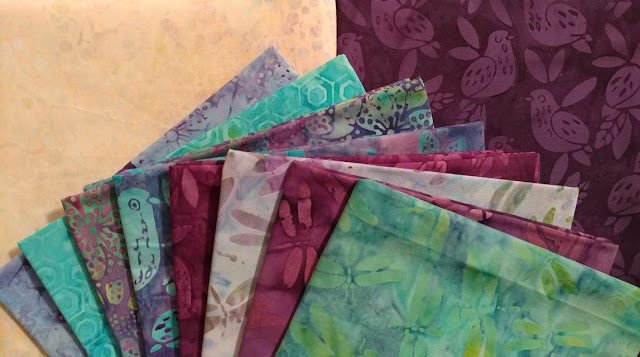 At Sample Spree (a buying frenzy of all new things related to fabric and quilting) I bought a fat quarter bundle of Menagerie fabric by Rifle Paper Co. for Cotton + Steel. I loved the popularity of the fabric, but I personally didn't love the fabric. I really wanted to design a quilt that would bring cohesiveness to all the prints, but also highlight the vintage vibe of the fabrics. This is when the Moonrise design began. 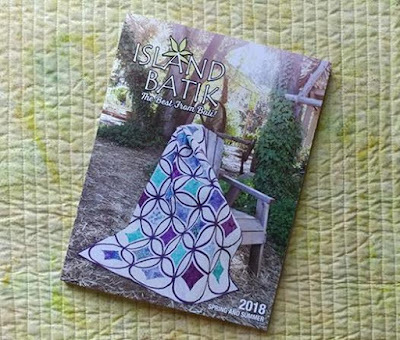 After working out all the logistics for how to make the quilt (and getting about halfway through making it), I decided to submit the quilt idea to Island Batik for their spring 2018 fabrics. They accepted the design and a funny thing happened. 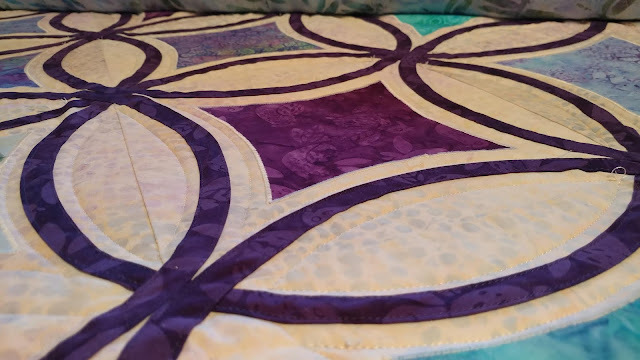 I liked the computer mock up with the Island Batik fabrics much more than I liked the original quilt I was working on! 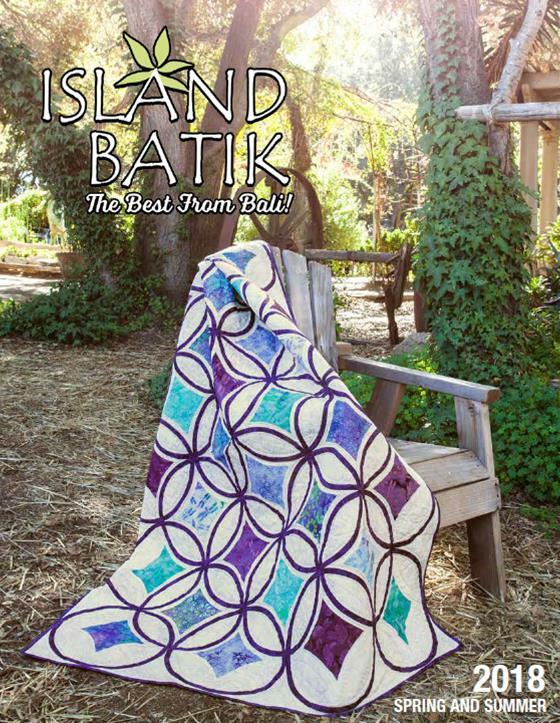 I decided the Island Batik quilt would need to be the one on the cover of my pattern. However, that meant I wouldn't be able to release the pattern until the fabric was released - in the spring of 2018! I received the Island Batik fabric from the Lavendula collection back in September. For the piecing and the raw edge applique, I used 50wt Aurifil #2000 Light Sand. 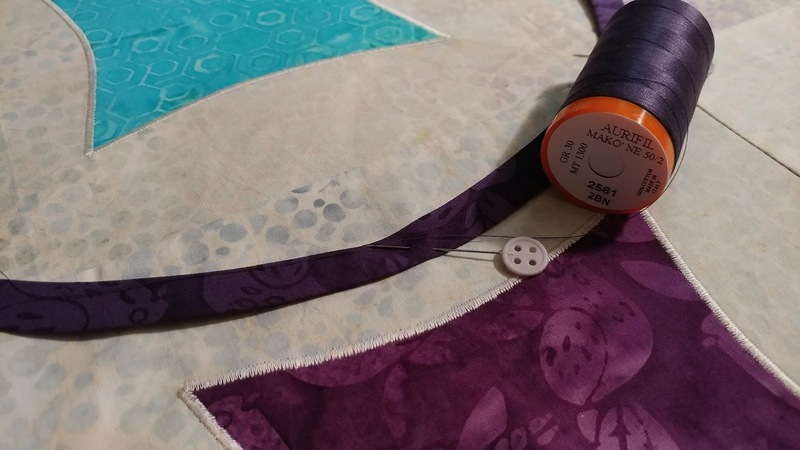 When sewing on the bias tape circles, I used 50wt Aurifl #2581 Dark Dusty Grape. I finished the quilt top in November so I could take it to my mom's over Thanksgiving to use her longarm to quilt it. 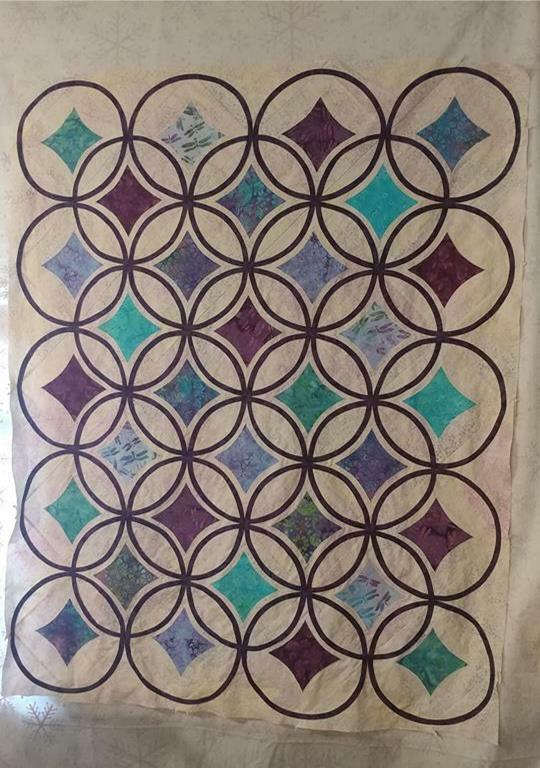 I was hoping to use a ruler to quilt the curves between the bias tape circles, but my mom didn't have a quilting ruler that would work. My dad offered to cut one out of scrap wood (which he did), but when cutting the wood, I noticed a curved ruler on his shop wall. It is apparently used in woodworking for marking curves, but it was the perfect shape for my curves too! 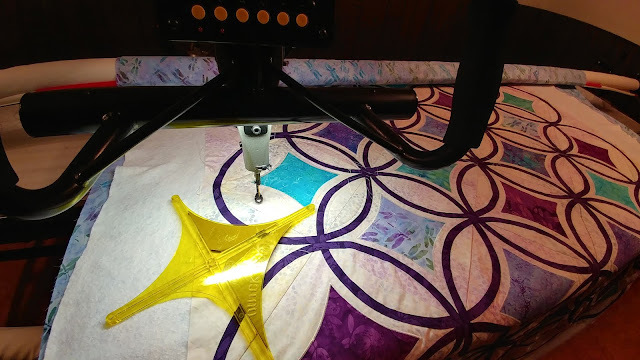 I was able to use the tool for quilting the whole quilt! I quilted only on the background fabric on either side of the bias tape circles using a light colored Glide thread. Although I know the "right" way is to bury the threads, I just didn't have the patience for that! 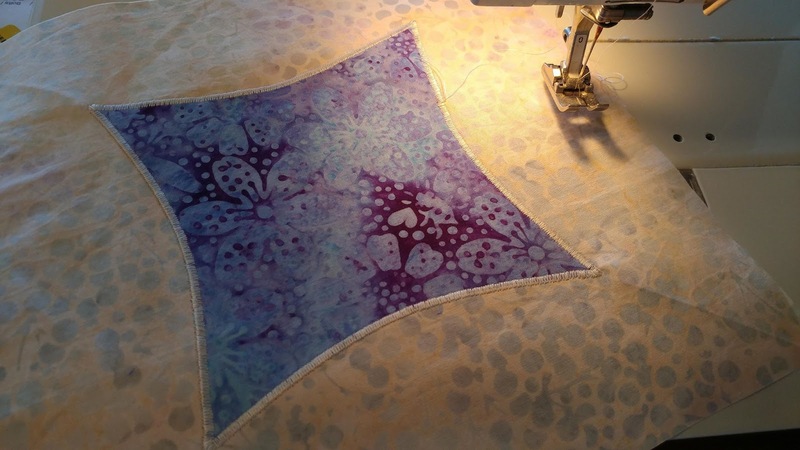 I decided to lockstitch with the longarm and hope for the best. 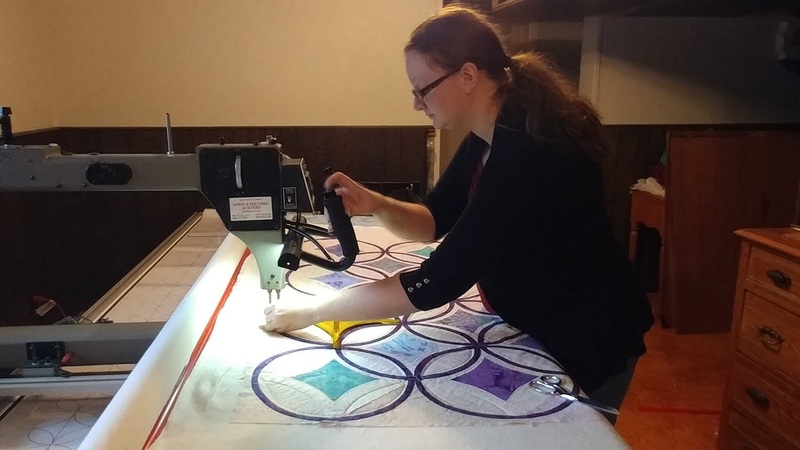 Once the quilting was done, I machine stitched the binding on and added a label. I sent the quilt off to Island Batik right at the end of November so they could take their own photos for the fabric catalog. 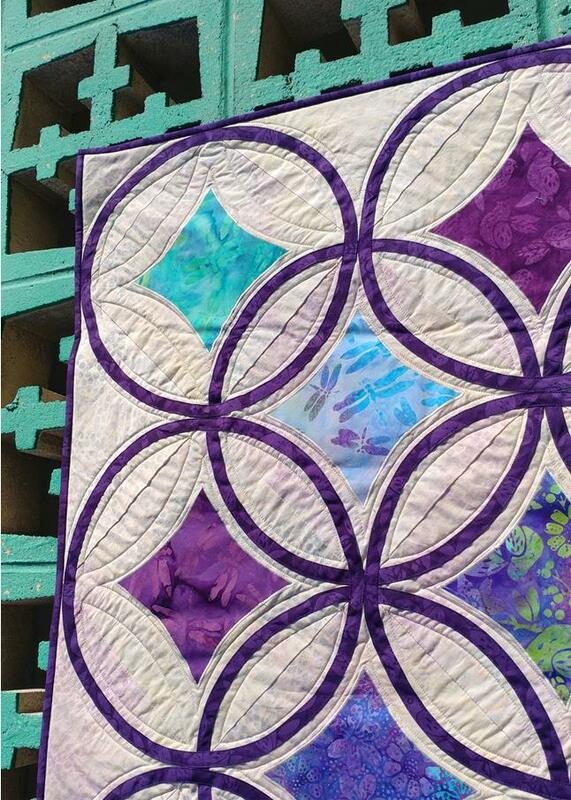 Then in February, I found out that the quilt was going to be on the cover of the Spring catalog!! There's even a little snippet of the quilt on the spine! And, 12 months after the fabric purchase that inspired it all, I can finally release the pattern! 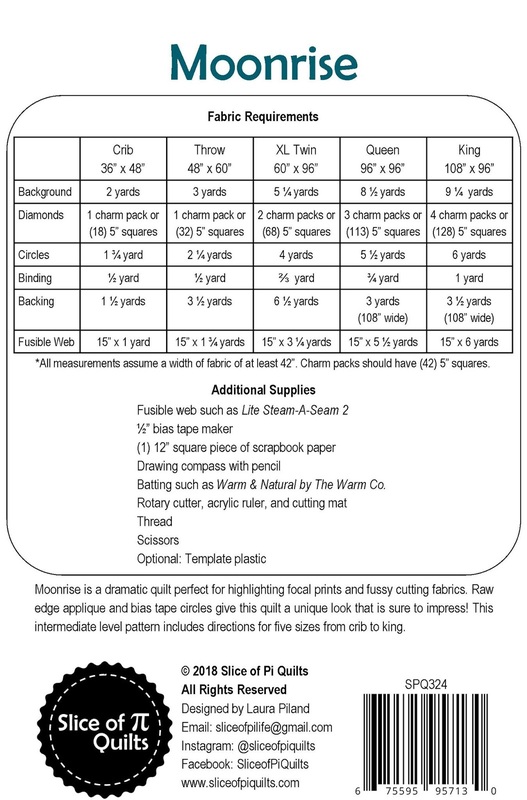 Printed patterns should arrive next week. You can find the digital pattern in my Etsy and Craftsy shops. In case you missed it, I also made a Moonrise quilt in Art Gallery fabrics. You can read about that quilt here. 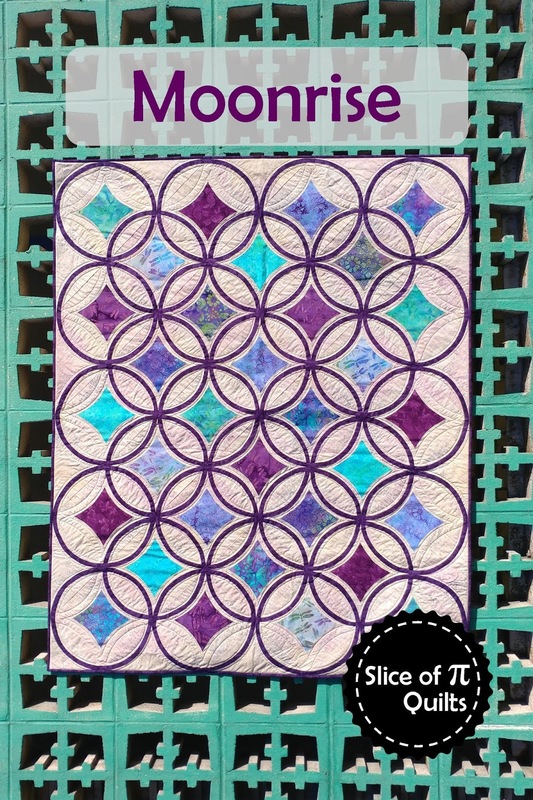 It will be at Quilt Market too! I am so excited for the quilt's debut at Quilt Market this week! I'll be watching all the Market photos on Instagram for peeks of it hanging in the Island Batik booth! Linking up with Let's Bee Social at Sew Fresh Quilts and Midweek Makers at Quilt Fabrication. It's lovely! 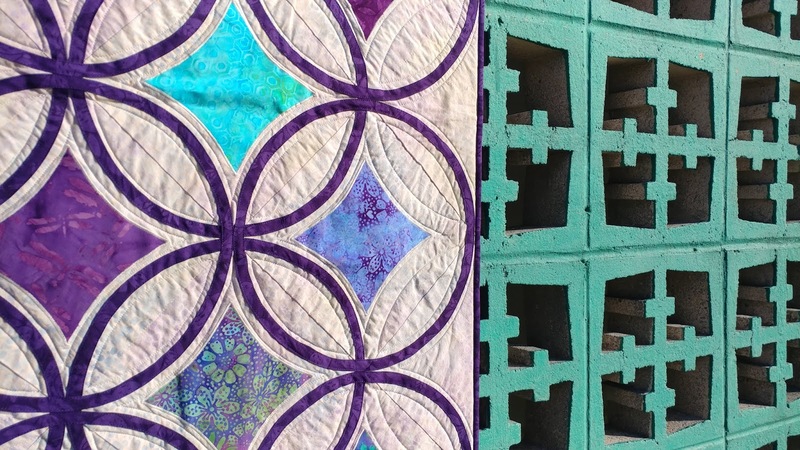 I'm curious - How did you attach the quilt to that wall to take the pictures? 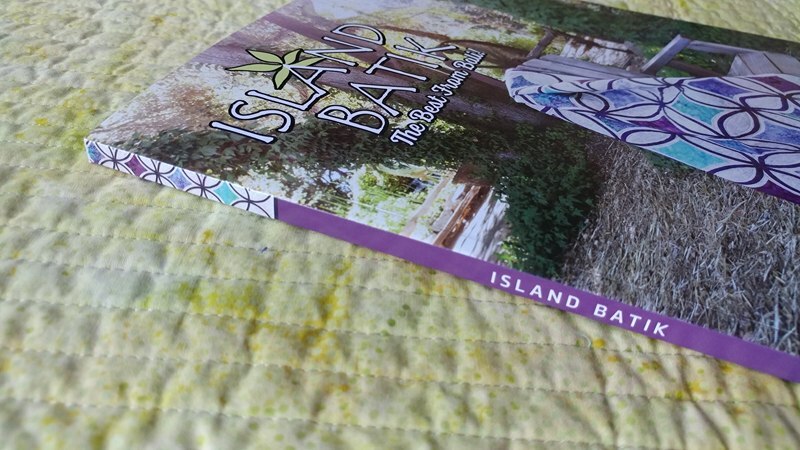 Congratulations on having Moonrise on the cover of the Island Batik spring catalog; and the detail on the spine is really fun! It seems like the wait was well worth it for this pattern. 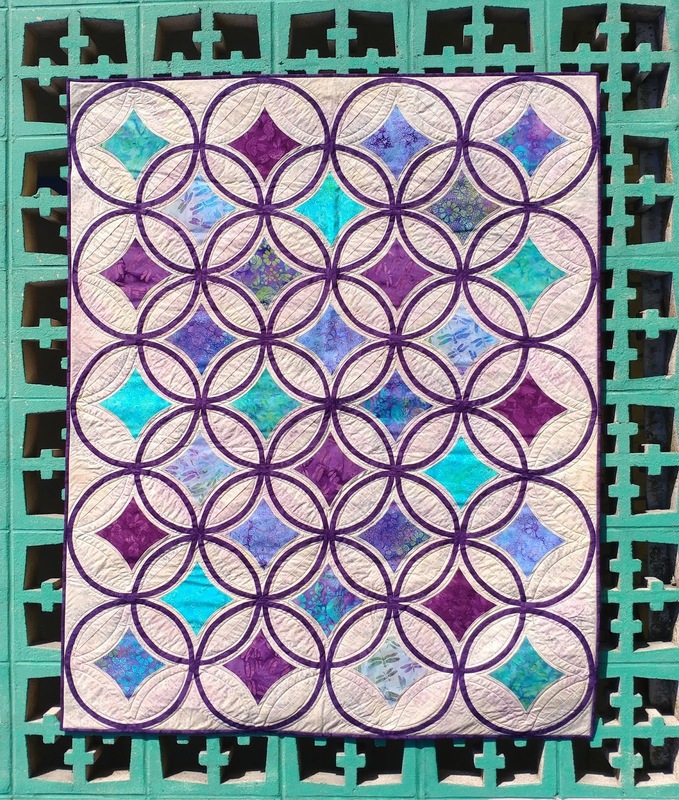 It's a beautiful quilt. No wonder it made the cover. I love the cinder blocks as a background as well. They are such an interesting colour. It's stunning, Laura and looks perfect on the cover :) The wall is a great backdrop, for sure!